Typically ESA's shaker tables are used to replicate the take-off vibrations of a satellite-lifting rocket. The large object seen here is not a satellite at all but an 8-tonne cooling system being subjected to a simulated earthquake – while blasting a chilly wave of air towards the engineer observing the test. The system travelled three hours by road to ESA's Test Centre in Noordwijk, the Netherlands, for testing to prove it can carry on running even in the midst of an earthquake with a peak ground acceleration of 1G on 3 axes – equivalent to a violent Level IX earthquake, stronger than the Fukushima earthquake of 2011. "To export to the Japanese market we have to satisfy very stringent seismic testing requirements," says Craig MacFadyen of Munters. "We need to show the cooling system doesn't fall to pieces and maintains its functionality during different grades of earthquakes." Testing was performed on ESA's Hydra multi-axis hydraulic shaker, the Test Centre's single most powerful shaker. See video of the testing here. "Hydra's hydraulic actuators move an 18-tonne shaker table in all three orthogonal axes simultaneously, in a similar fashion to an aircraft flight simulator," explains Alexander Kuebler of ETS, the company operating the Test Centre for ESA. "The motion of these actuators is overseen by a network of 36 parallel computers. The entire installation is braced by a seismic mass supported by springs and shock absorbers to prevent the resulting earthquake-strength vibrations spreading through the rest of the Test Centre. Up to 512 acceleration measurement channels can be used during testing, acquiring the maximum possible data for the customer." Hydra has served many of Europe's largest space missions, including Envisat – at 8 tonnes the largest-ever civil Earth observation satellite – Herschel, and the Automated Transfer Vehicle, which weighed 22 tonnes at launch. 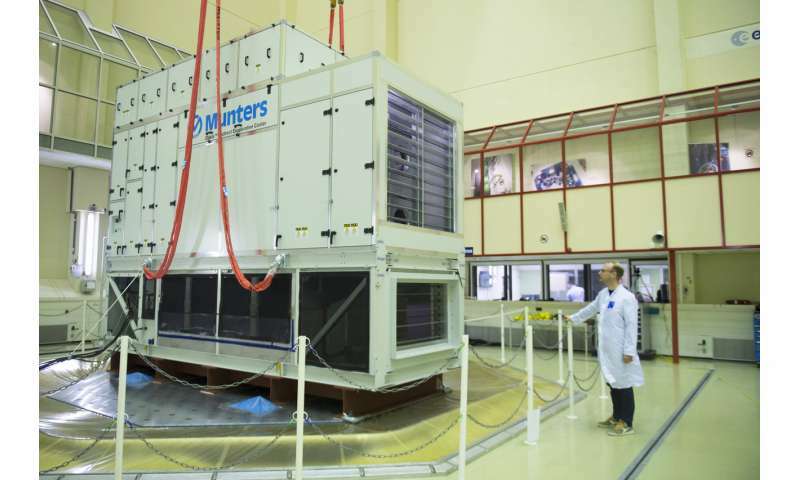 ESA's Test Centre in the Netherlands is the largest facility of its kind in Europe, providing a complete suite of equipment for all aspects of satellite testing under a single roof.